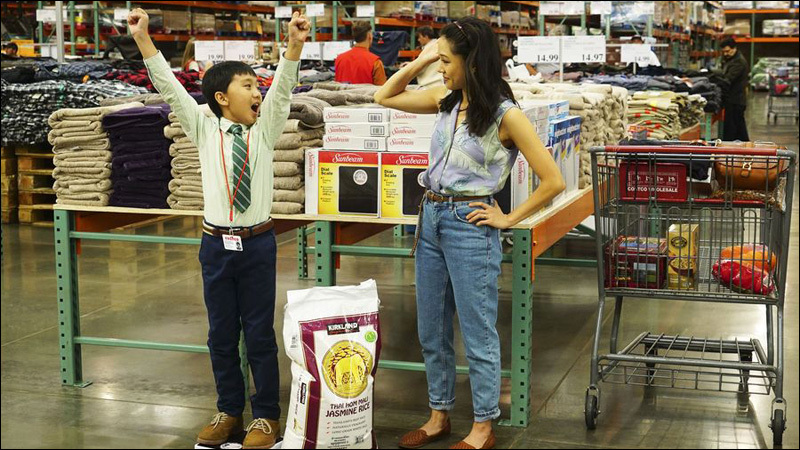 Fresh Off The Boat stars Randall Park as Louis, Constance Wu as Jessica, Hudson Yang as Eddie, Forrest Wheeler as Emery, Ian Chen as Evan, Chelsey Crisp as Honey and Lucille Soong as Grandma Huang. This week, Jessica is thrown for a loop when Evan chooses church over Costco. "WWJD: What Would Jessica Do"
Sundays are usually reserved for Jessica and Evan's weekly Costco run, but Jessica is thrown for a loop when Evan decides to go to church instead. Meanwhile, Marvin treats Louis to a free teeth-whitening session, and Eddie and Emery find creative ways to get rid of the healthy cereal in the multi-pack. Guest starring are Yeardley Smith as Marie, DK Uzoukwu as Carmine, Luke Judy as Zack, Raymond Forchion as Ted and Andrew Patrick Ralston as Greg. "WWJD: What Would Jessica Do?" was written by Laura McCreary and directed by Matt Sohn.